1901 Viaduct no longer part of the plan to modernize the Hook south of Chemnitz based on decision by Ministry in Berlin. CHEMNITZ, GERMANY- The Hook in Chemnitz, located in the central part of the German State of Saxony, is a 2.8 kilometer railroad bypass that encircles the southern part of the City Center. It includes the railway Stations of Chemnitz-Mitte, Chemnitz-Süd and Chemnitz Central (Hauptbahnhof). The entire Stretch is 65 years old, has been considered outdated and not suitable for modern (long-distance) trains, especially as the City is working together with the German Railways (The Bahn) to have long-distance trains passing through Chemnitz for the first time in 15 years. Yet the good news is that this missing link is a big step closer to reality. The German Ministry of Railways in Berlin, on Friday, approved an 80 Million Euro Project to reconstruct the Hook, which will feature new railroad tracks between Mitte and Central, new train stations at Mitte and Süd, upgrading them to fulfill modern (and also) handicap standards, the removal of a functionally obsolete bridge at Mitte and the replacement of four bridges. Der geplante Abriss des Chemnitztalviaduktes wird aus denkmalschutzrechtlichen Gründen abgelehnt. (EN: The planned demolition of the Chemnitz Viaduct has been rejected because of its Status as a Legally-Preserved Monument). The decision has been met with relief for many and a victory for others, as the viaduct has been considered part of Chemnitz’s history, even though it is the second crossing at this spot. Its predecessor was a 12-span concrete arch bridge that was built in 1884 crossing the River Chemnitz and Annaberger Strasse, serving the Nuremberg-Hof-Zwickau-Dresden Magistrate. 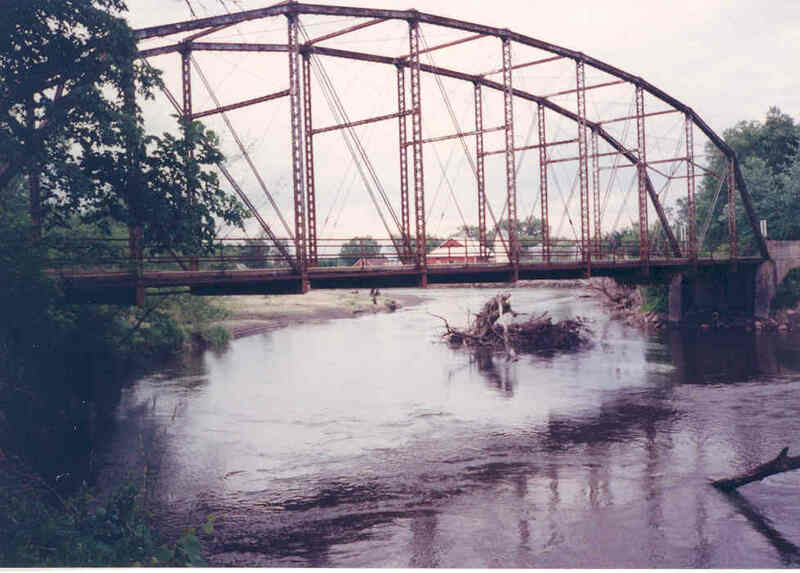 Due to flood risks, a steel arch viaduct built 20 meters higher and 50 meters north of the site was built in 1900-01 and the arch span was later removed. The Viaduct has been serving rail traffi ever since. Plans for demolishing the viaduct was first presented in 2003 as the Bahn had presented a proposal to modernise the Hook. The plan was met with a high, sturdy wall of resistance, which featured online petitions, presentations, initiatives and even a structural study by bridge engineers with experience restoring historic bridges– All of them supported restoring the historic bridge and making it suitable for long-distance trains, in particular the InterCity trains from Cologne and Nuremberg. As with the measure involving the Frank Wood Bridge in Maine, they even brought this matter to court, where the Office for Preserved Artefacts (Denkmalschutzamt) decided to forward the matter to the Ministry of Railway in Berlin, with success on the part of the historic bridge and the City of Chemnitz. With this decision, the Bahn has decided to proceed with the plan of modernizing the Hook without the Viaduct. Construction is expected to begin in the Fall 2019 and should last four years. The bridges expected to be replaced will include a 1920s bridge at Chemnitz-Süd, a concrete overpass at Chemnitz-Mitte stemming from the East German times and two smaller bridges. As for the Chemnitz Viaduct, the bridge will not be renovated before 2022 which gives all parties time to come up with a plan to restore the bridge to accomodate rail traffic and calculate how much time is needed to complete the second phase of the project along the Hook. This will not affect the reintroduction of InterCity trains for delays in electrifying the line between Glauchau and Weimar via Jena combined with problems with modernizing the rail line south of Hof in Bavaria will most likely result in the use of diesel trains for the IC-trains before the electrification project is completed by 2030. Furthermore, the IC-line to Rostock via Leipzig and Berlin will most likely be in service before 2020, which will put Chemnitz back on the map and in the Fernverkehrsnetz (Long-distance Train Network) for the first time since the last ICE-Train passed through in early 2002. 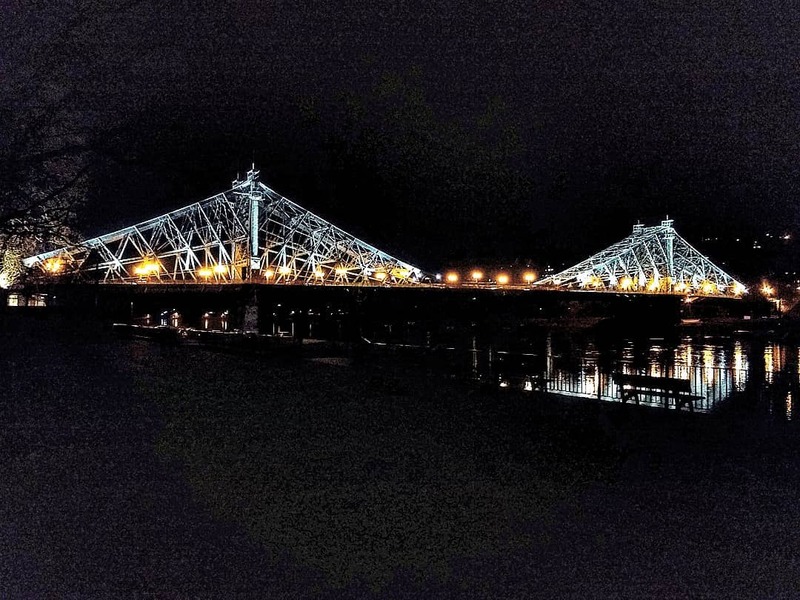 Two-span iron truss span over the Mulde River one of eight crossings facing construction in the next year. AUE (SAXONY), GERMANY- Construction is heating up this summer as many roads and highways in Germany are being reconstructed, retaining walls in the mountain regions are being rehabilitated and dozens of bridges are being restored to their former glory. The most striking is the fact that not just one, two or three bridges, but as many as nine bridges spanning the River Mulde in western Saxony are being scheduled for work in one way or another. Apart from building a new cable-stayed suspension bridge at Schlunzig (south of Glauchau), three bridges in Glauchau alone are being beautified, including the Hirschgrund at the castle complex, 400 meters from the river. The oldest covered Bridge in Zwickau (the Röhrensteg) is being restored and is taking longer than expected. The Cainsdorf Bridge south of Zwickau is being planned for replacement. Everyone knows about the Bockau Arch Bridge replacement project near Aue and its pending future after the new bridge opens next year. Then we have a crossing at the Eibenstock Reservoir, built in 1980, plus the 151-year old stone arch bridge in Wilkau-Hasslau that have cracks in the concrete and will need to be closed for repairs, forcing drivers to make detours of over 25 kilometers per bridge. And then we have this bridge- a pedestrian bridge between Schlema and Aue that is now closed to all traffic. 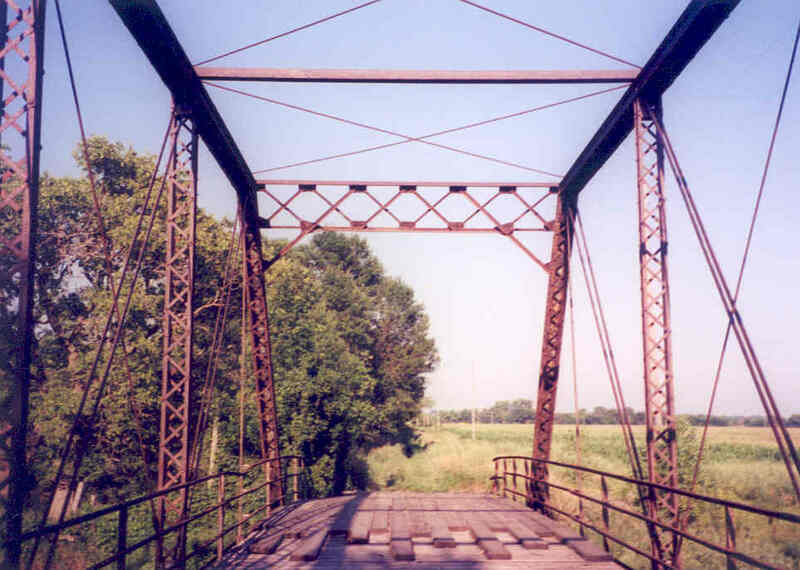 Workers recently closed the over 115-year old structure as they plan to rehabilitate the two-span Parker through truss span, whose predecessor was a wooden covered bridge. According to the Free Press in Aue, the decking of the bridge will be rebuilt and then integrated into the Mulde Bike Trail network. The trail itself is in the middle of construction and when completed this fall, it will run parallel to the river from Aue to Schlema, crossing the Iron Bridge. It currently shares a street connecting the two communities, but sharp curves and steep hills make it dangerous for cyclists and drivers alike. The catch to the problem however is with the railroad crossing. Because the current gates, used for pedestrians, are not suitable for cyclists, officials are looking at three options, all of them will cost as much as the project itself, which is 500,000 Euros (ca. $620,000). The first option is a modern railroad crossing guards like at the train station Bad Schlema. Another is a tunnel under the railroad tracks, which will require multiple closures of the rail line between Aue and Zwickau. 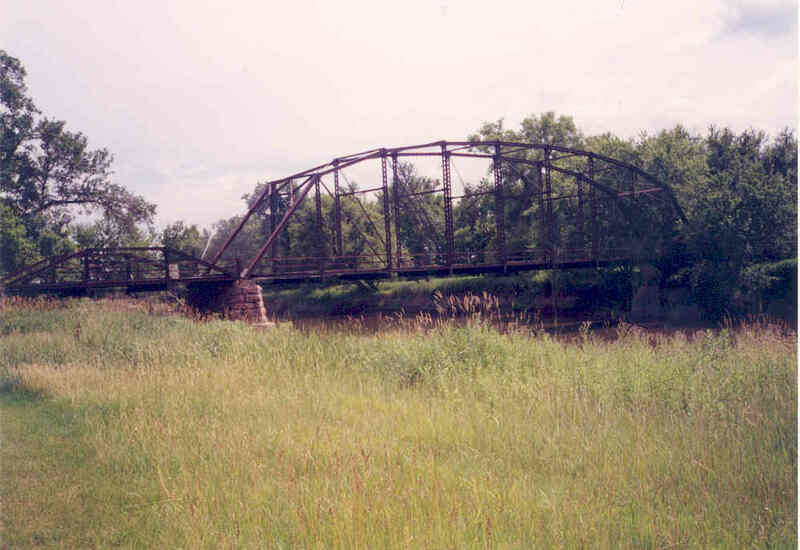 And then there is a bridge that would cross over the tracks before gliding down towards the historic structure. Officials believe the third variant would be built and open by 2019. In either case while the bridge renovations may be cheap, the solution for the railroad crossing on the east end may be the one that could break the bank. Still, when the project is finish, cyclists can go from Eibenstock to Schlema without having any interruptions with detours, etc. There is hope that this stretch can be extended to Hartenstein (five river kilometers from Schlema), which would include restoring the Schlema Stone Arch Bridge. But because of lack of funding, chances are likely that after the fusion between Aue and Schlema, financial resources will be available to make both projects happen. The interest is there but in praxis, it is a different ball game. But for now, the Aue-Schlema has priority while the story continues with the other stretch….